Pictured is the Four Corners intersection in Powell. In an attempt to crack down on the number of illegal left-hand turns being made at Powell’s Four Corners downtown intersection, the Powell Police Department has begun deploying officers to the area to enforce the traffic law. 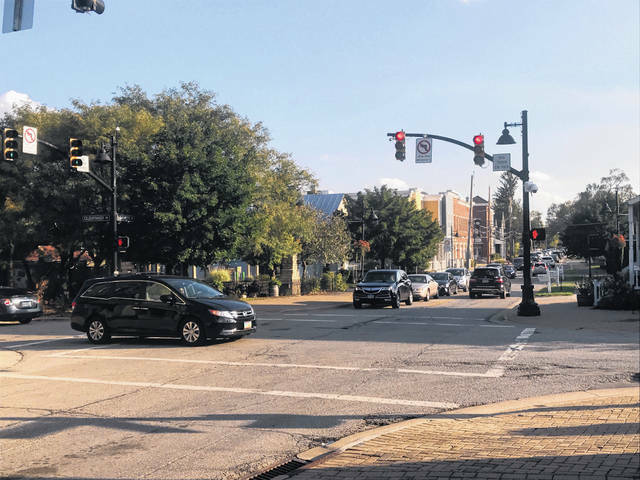 Drivers holding up traffic during the restricted hours of 4 to 7 p.m. on weekdays has become a nuisance in an area that already sees significant traffic, with many complaints coming in from local residents, Police Chief Gary Vest said. On Tuesday, Sept. 25, the first of three enforcement dates, seven officers were deployed and wrote 14 citations for illegal left turns. Each ticket carries a fine of $135. In addition to written tickets, nine warnings were also issued. Vest said the restricted period for all directions of traffic has been in place for approximately a year, although with not much effectiveness. According to a study presented to Powell City Council on Tuesday, the traffic camera in the Four Corners intersection caught over 475 prohibited left turns being made at the intersection per week in both June and August. Drivers turning left from South Liberty Street onto West Powell Road and from North Liberty Street onto East Powell Road made up the vast majority of the observed illegal turns in the study. Two additional dates — today and Thursday, Oct. 10 — are planned for heavy enforcement, although officers could be in the area at any time. Vest said he has been asked why the public is being informed ahead of time of these enforcement dates. He said the ultimate goal is to discourage drivers from making the turns, not to catch everyone and hand out tickets. Drivers are encouraged to use bypasses of downtown, such as Murphy Parkway or Grace Drive, if a turn is necessary. Vest said the traffic light coming to the intersection of Grace Drive and Liberty Road should significantly increase the effectiveness and viability of that alternate route. After the enforcement dates, Vest said the police department will monitor their impact and continue to “see what works” to create a “change of behavior.” If a noticeable impact is not seen, he said more heavy enforcement dates will be planned. “If we can get the compliance, great. The irony of it is, if I send somebody out every day and they stop somebody, unfortunately, three cars behind (the traffic stop) would turn left while the officer is on a traffic stop,” Vest said. He also said he has even seen cars try to turn left with an officer in the intersection, directing traffic. Asked about the potential for extending the restricted hours to mornings as well, when traffic can backup equally as much, Vest said it is certainly something that needs to be looked at and something he believes city council will continue to look into addressing.